I had so many plans for this Thanksgiving week. I was actually going to dedicate a whole post to Thanksgiving and write all about Thanksgiving's history and how my family celebrates it for my Iranian readers. But I guess that's going to have to wait for next year. Hopefully I won't be as busy then as I was during this past week. 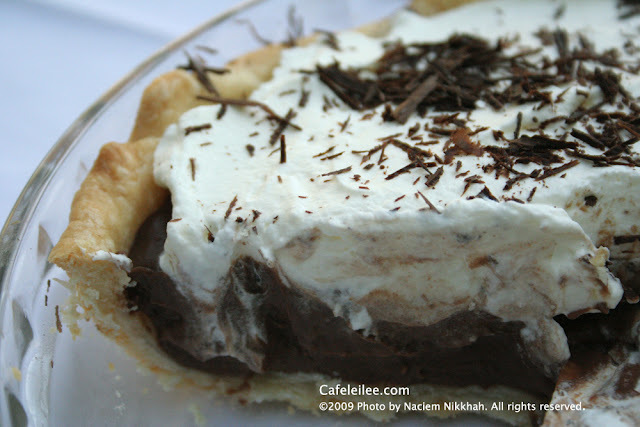 For now, I'm going to share with you this delicious recipe for chocolate cream pie, adapted from Cooking Light. To prepare the crust, lightly spoon the flour into dry measuring cups, and level with a knife. Combine 1/4 cup flour and water, stirring with a whisk until well-blended. Combine 3/4 cup flour, 2 tablespoons sugar, and 1/8 teaspoon salt in a bowl; cut in shortening with a pastry blender or 2 knives until mixture resembles coarse meal. Add slurry; mix with a fork until flour mixture is moist. Press the mixture gently into a 4-inch circle on heavy-duty plastic wrap; cover with additional plastic wrap. Roll dough, still covered, into a 12-inch circle. Freeze 10 minutes. Remove 1 sheet of plastic wrap; fit dough into a 9-inch pie plate coated with cooking spray. Remove top sheet of plastic wrap. Fold edges under; flute. Line dough with a piece of foil; arrange pie weights or dried beans on foil. Bake at 425° for 20 minutes or until edge is lightly browned. Remove pie weights and foil. Reduce temperature to 350°. Bake an additional 5 minutes; cool on a wire rack. To prepare filling, combine 3/4 cup sugar, cocoa, cornstarch, 1/8 teaspoon salt, and milk in a medium saucepan; stir well with a whisk. Cook, stirring constantly, for 1 minute until mixture comes to a full boil. Gradually add 1/3 cup hot milk mixture to beaten egg; stir well. Return egg mixture to pan. Cook 2 minutes or until mixture thickens, stirring constantly. Remove from heat; add grated chocolate, stirring until the chocolate melts and mixture is smooth. Stir in vanilla. Spoon mixture into pastry crust. Cover surface of filling with plastic wrap. Chill until set (about 2 hours). 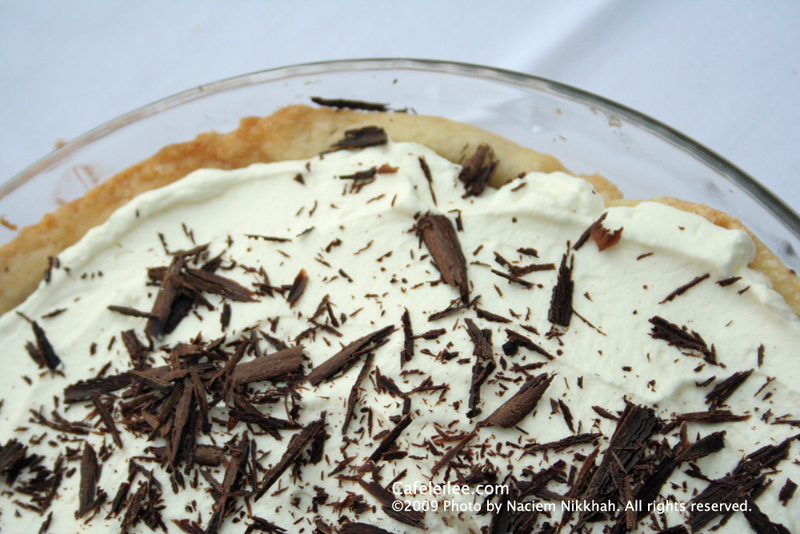 Remove plastic wrap; spread whipped topping evenly over filling. فر را روی درجه ۴۲۵ فارنهایت یا ۲۲۰ درجه سانتیگراد روشن کنید تا گرم شود. برای درست کردن خمیر پای، ۴/۱ از آرد را با آب مخلوط کنید تا آرد کاملا در آب هل شود. باقی ۴/۳ آرد را با ۲ قاشق شکر و نمک توی یک کاسه بزرگ مخلوط کنید. روغن را اظافه کرده و با دست خمیر را مالش دهید تا به شکل گوله هایی اندازه نخود در آید. بعد مخلوط آب و آرد را اظافه کنید و با دست مخلوط کنید تا به شکل خمیر در بیاید. اگر خمیر چسبنده بود اشکالی ندارد. خمیر را روی یک کاغذ روغنی به اندازه کمی بزرگتر از سطح ظرف پای باز کنید و آنرا توی فریزر به مدت ۱۰ دقیقه بگذارید بماند. برای توی پای، ۴/۳ پیمانه شکر را با پودر کاکائو، نشاسته ذرت، نمک، و شیر داخل یک قابلمه استیل یا لعابی مخلوط کنید و روی حرارت متوسط به جوش بیاورید. (نکته مهم این است كه این مخلوط را باید مدام هم بزنید وگرنه مایه ته میگیرد) وقتی مایه به جوش آمد، کمی از آن را به تخم مرغ زده شده اظافه کنید و خوب مخلوط کنید، سپس مخلوط تخم مرغ را به قابلمه اظافه کنید و مخلوط را خوب هم بزنید تا مخلوط سفت شود (حدود ۲ دقیقه) قابلمه را از روی اجاق ور دارید و شکلات رنده شده را اظافه کنید و مخلوط را هم بزنید تا شکلات آب شود. بعد وانیل را اظافه و خوب مخلوط کنید. مایه را توی ظرف پای روی خمیر پای آماده شده بریزید. روی آنرا با یک ورقه نایلون بپوشانید تا پوست نیاندازد و بعد از اینکه کمی خنک شد آنرا توی یخچال به مدت ۲ ساعت بگذارید تا بماند. نایلون روی مایه را بردارید و خامه را روی پای پخش کنید و روی خامه را با شکلات رنده شد تزیین کنید.